You just purchased an Image auger filler. Now how will you get your product up into our hopper? The SD floor hopper sits only 36″ off the ground. 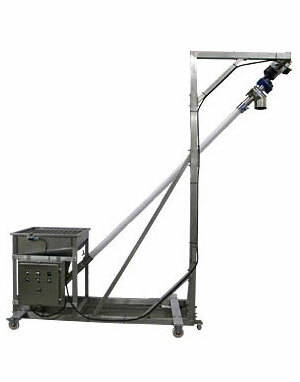 Your product can be loaded into this hopper and conveyed up into the Image auger filler. What sets this machine apart from others is the fact that it is mobile. You can move it from room to room for cleanout or to use on other machinery. Please go to our quotes page to get your pricing today. See our fixed screw conveyor for lower ceiling height applications. Motor with 5:1 inline gear reducer.